Like many Thinking-type women, Bathsheba doesn’t quite fit her society’s expectations for femininity and she’s well aware of that fact. This doesn’t bother her at all, and she puts her practical and logical skills to good use managing the farm she inherits from her uncle. Like many other ISTJs, she’s detail-oriented, straight-forward, and very good at her chosen profession. She impresses most of the people around her, yet she’s also quite human and makes some very poor emotion-based decisions. In typical ISTJ fashion, though, she commits to living with the consequences of her choices and thankfully things work out for the best in the end. Quote from Far From the Madding Crowd by Thomas Hardy (1874). 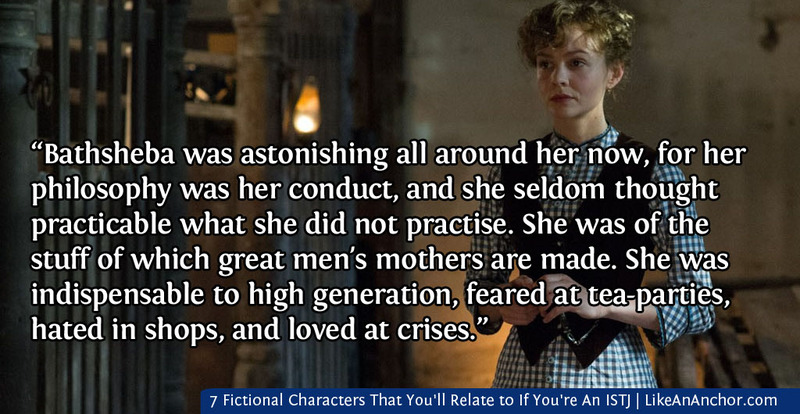 Image: Carey Mulligan as Bathsheba Everdene. 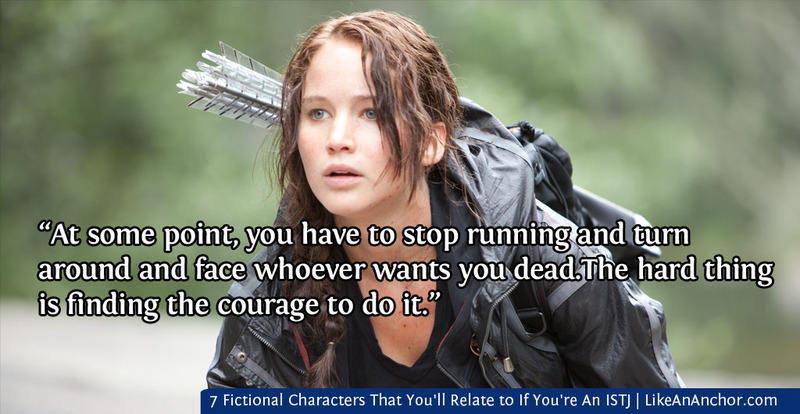 Katniss is a practical, grounded character who, like many other ISTJs, is also resourceful and clever. She’s sometimes typed as an INTJ, but I think that comes from confusion about the real difference between Sensing and Intuition. The mis-type might also be related to Katniss’ ability to analyse situations quickly and come up with a rational course of action, which is related to her being a TJ type but is often mistaken for an NT trait. Real-life ISTJs can relate to Katniss’s commitment to protecting the people she cares about and her reliance on past experience (her’s and others’) for guidance. Like many TJ types, she’s more comfortable expressing decisive, rational thoughts rather than with sharing her feelings or talking about personal convictions. Of course, she does feel things deeply and her tertiary Introverted Feeling plays a big role in how she responds to the people and situations around her. 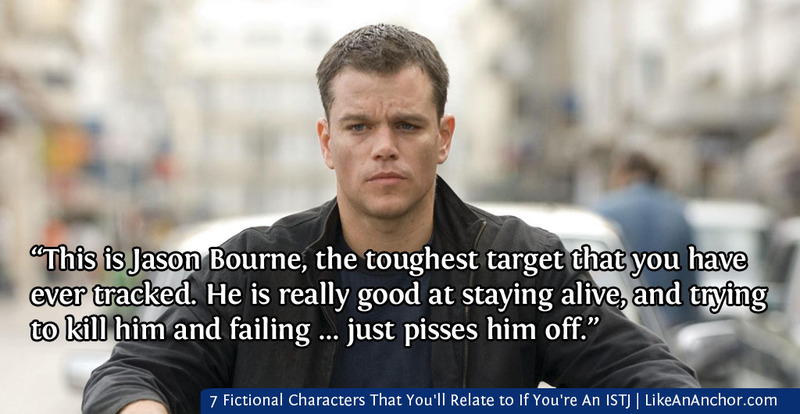 For many ISTJs, the Bourne films are among their all-time favorite movies. Not only do they like the plot, but Jason Bourne is one of the few action heroes that people don’t automatically type as an ISTP. Many think he’s more of an ISTJ, and I’m inclined to agree (though his training and past trauma makes typing difficult). Jason Bourne is a good man who devoted himself to doing what he thinks is right, and who isn’t going to blindly follow orders or let people walk all over him. While the break-neck action pace of his life doesn’t seem like something most ISTJs would choose, it is something that an ISTJ trained for that sort of situation could handle. And when Jason thinks he’s safe he settles into a comfortable life with his girlfriend and spends his days jogging, writing in his journal, and living the sort of peaceful, structured life that ISTJs find so appealing. Quote from character Pam Landy in The Bourne Ultimatum (2007). Image: Matt Damon as Jason Bourne. White Collar is one of my personal favorite TV series, but that’s not the main reason Peter Burke is on this list. All too often, ISTJs in fiction are stereotyped as being oppressively by-the-book, stiff, humorless people. Not so with FBI Agent Burke. His character perfectly captures both the “do what’s right,” traditional and cautious side of the ISTJ personality type while also showcasing their unique sense of humor and personalized way of making sense of the world. Both ISFJs and ISTJs look at the world in a way that’s highly personal and often quirky and a little off-beat as well. 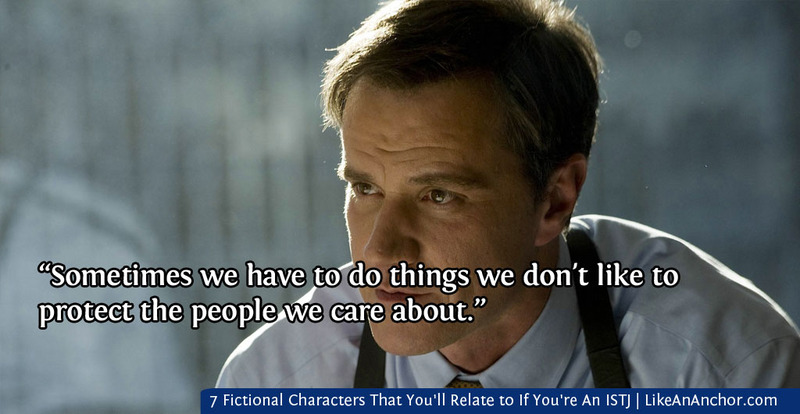 Unless someone is close to them this side of their personality is rarely seen, though, and White Collar does a very good job of capturing that in fiction. I love that with Peter Burke, we get to see a mature, fully-fleshed out character with the ISTJ personality type who’s highly sympathetic and more than a match for the clever, charismatic ESTP Neal Caffrey. I’ve written a lengthy article on why I think Rey is an ISTJ type, so I’m not going to spend too much time on her in this post. You can click here to read my article on her personality type. One thing I do what to focus on here is the way that Rey embodies a key trait of ISTJ types. 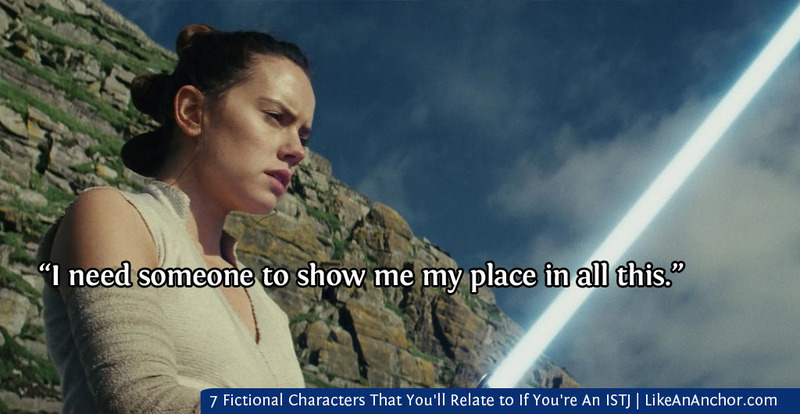 Personality Hacker said, “Of all the types, ISTJ is the most driven to fulfill its role in society.” We can see this in Rey’s desire to figure out her “place in all this.” She’s not driven primarily by connection (even though she values friendship and family). She’s driven by finding belonging in what she’s meant to do and who she’s supposed to be. And I think there are quite a few ISTJs who can relate to that. 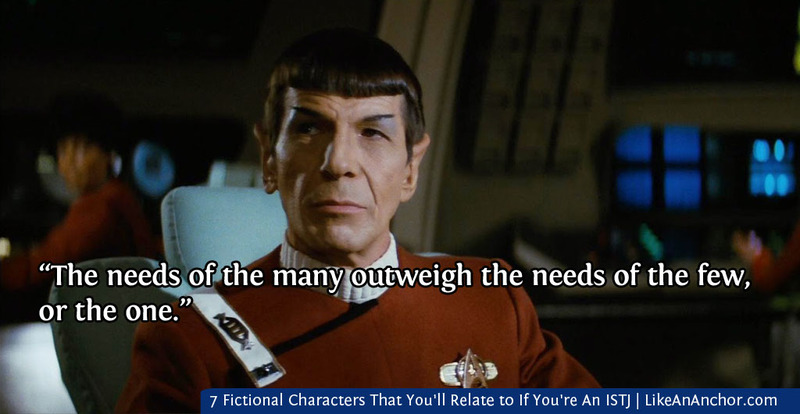 Spock isn’t all facts and logic, though. As we learn more about his character, it becomes apparent that his perspective on the world is much more personalized than it at first appears. Like many ISTJs, Spock acts based on what he thinks is right and where he thinks he belongs based on his preferred method of learning and processing new information — Introverted Sensing. He is task-oriented, contentious, unflinchingly realistic, reliable, and extremely loyal to his friends — all traits of healthy ISTJs. Teal’c comes from another of my favorite TV series, Stargate SG-1. He’s an alien who once served a parasitic, tyrannical race called the Goa’uld and now fights against them alongside his human teammates. Like other ISTJs, he acts based on what he believes is right and filters all his experiences through what he’s learned from his past. Though he’s a very different character than Spock, much of what I just wrote about that character could apply to Teal’c. Both filter the world through their personal concepts of right and wrong and act in accordance with their perceived duty. They’re both focused, contentious, reliable, and loyal characters. 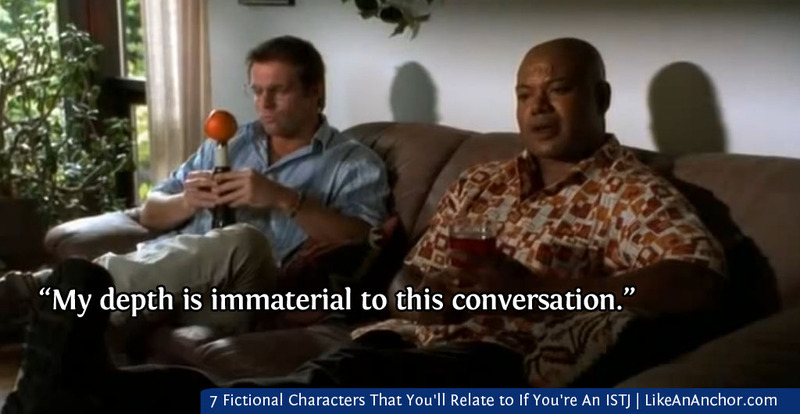 Teal’c also displays another trait that real-life ISTJs can relate to — a very personalized style of humor. It takes quite a while for the humans around Teal’c to get to know him well enough to recognize when he’s joking, but they (and the audience) learn to appreciate his quirky perspective on things and the dead-pan humor he brings to a conversation. What did you think of this list? 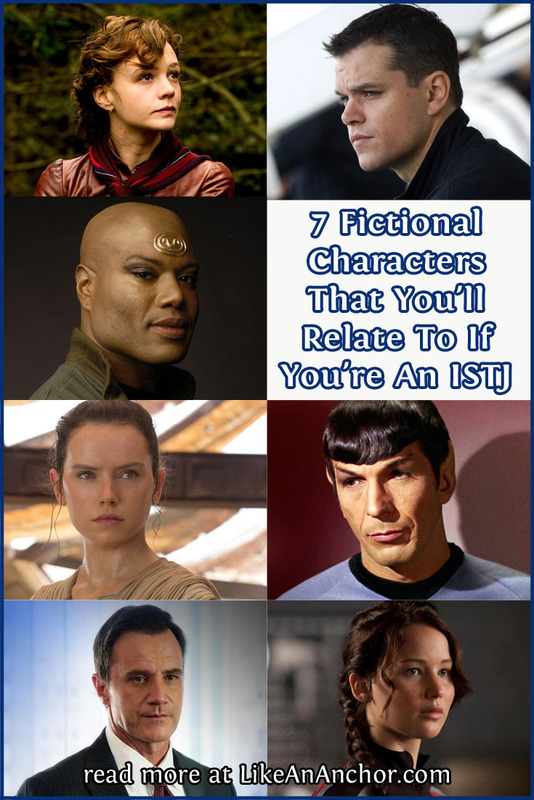 If you’re an ISTJ, which fictional characters do you relate to best? Is there anyone you’d add to or take off of this list? I’d love to hear your thoughts! ← God Knows Your Heart, But Do You Know His?